Portland has changed a lot since I was last here. The Society Hotel is definitely a place where originality is appreciated. Whether you’re a local coming to hang out with friends or a traveler from really anywhere in the world, The Society is where people come to meet and mingle. Part of Downtown Portland’s boutique hotel scene The Society is the cool kid on the block – this is obvious. 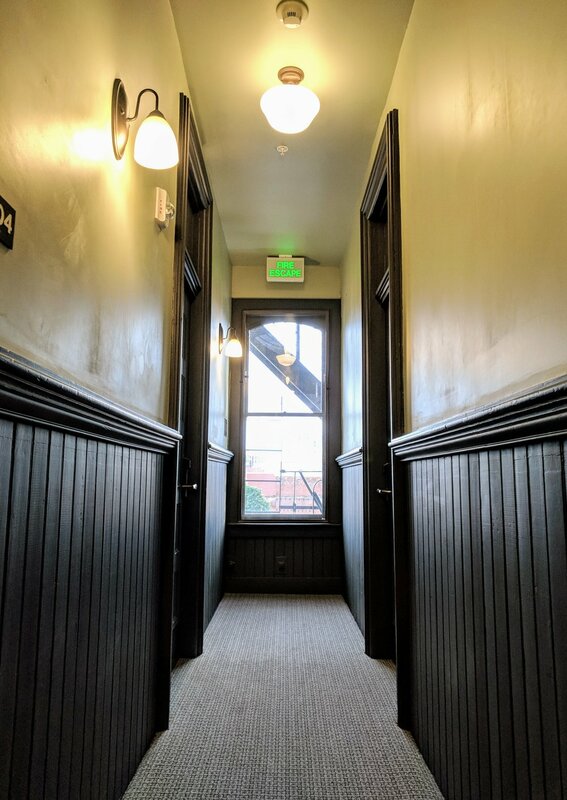 More and more businesses are changing their perspective on Old Town Portland and The Society saw the value of this long before anyone else did. Centuries ago it used to be a port of call to sailors, immigrants, and wayfarers. As you walk around try to imagine the old mariners wharf. It should be easy to do amongst all of the cast-iron building façades. FUN FACT: Outside of Lower Manhattan, there is no higher a concentration of 1880s façades in the country like this. Well done Portland. The building that The Society occupies is known as the Mariners Building (which was built in 1881). The whole point of the building was to provide a better standard of living for sailors, who the city’s industry relied upon. Could there be a more fun fact?! Similarly to the function of the building now, The Mariners Building was a boarding house for sailors, in order to give them a safe place to stay away from the seedy scene of the Shanghai tunnels (also amazing fact). When people think of the Chinatowns in various cities San Francisco always comes to mind. But move away from this right now! Portland’s Chinatown was once the largest of its kind in any city on the West Coast. And not only that, lying below the city are the Shanghai Tunnels (Portland's Underground) which awesomely still line up with the basements of many of the historic buildings in the area. WHAT ARE THE SHANGHAI TUNNELS? They were (and still are) a group of passages underneath the Old Town/Chinatown area of Portland which connected the basements of many hotels and taverns to the Willamette River waterfront. Originally built to move goods from the ships docked on the Willamette to the basement storage areas, they allowed businesses to avoid above ground traffic. With the motto: “Change your hotel perspective,” you know you're in for a unique experience. Catering to the more adventurous traveler (such as myself) The Society has been continually impressing adventurers for the past 4 years. Its clean and modern architecture coupled with its historical aspects really give you a feel of Portland’s past, present and future. So when you're walking through Old Town don't forget to look up! It's easy to stroll right on past not evening realizing it's a hotel. Part Hotel, part Hostel & Café, The Society is here to suit any and all of your needs. It's because of this history, the vibe of the place, and the staff, that I knew I would thoroughly enjoy my stay. I was able to experience one of their corner standard rooms – and everyone knows the corner rooms are the best. 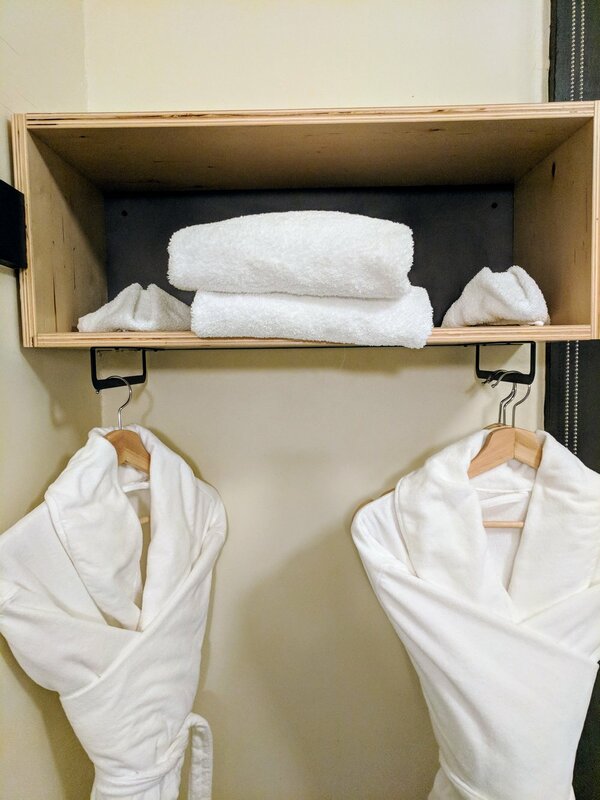 Although simple in the room amenities (there was a bed with storage, a wall storage shelf with my towels and robes, and a sink), the room was comfortable and amazingly bright with my two windows. I had a great view of Old Town and could even look out and see the Chinese Garden just at the end of the block. I liked the simplicity of the room. The dark and light accents with industrial looking lamps and fan were perfectly modern, and seeing as I am someone who doesn’t like a lot of stuff in their own apartment bedroom I welcomed the chic simplicity. Not having a bunch of things to distract you, or a TV, allow you to really just sit back and relax. The floor I was staying on did have shared bathrooms but really for someone who has stayed in multiple hostels this isn’t a huge deal. The blessing of having a simple room is it makes you want to get out and explore the rest of the property. This is where I think the hotel really shines. The social areas are on point and lend themselves to connecting with other travelers and locals. I will never say no to a rooftop. Anytime I have the opportunity to get up high and get that aerial view of a city I am on board. I think Portland is really working on spaces that have accessible rooftop areas, because with the hills to the west and the river to the east there are some pretty spectacular sights to take in. Everything really does look better from above and The Society offers a 360-degree view! From downtown Portland, to the Lan Su Chinese Garden, to the Willamette River, and Cascade Mountains their rooftop is the perfect place to sit and relax and just take in that fresh Pacific Northwest air. Not only that the layout of the rooftop is perfect for mingling and meeting other travelers during your stay. Since I was in Portland towards the end of Fall the weather was less than ideal most days, but I did get lucky to arrive at the hotel on a clear day! You better believe right after checking in I dropping my bags off quickly in my room and headed straight up to the roof. TIP TO NOTE: During the colder seasons they have rooftop heaters, making a space in Portland fully functional year round. They also encourage you to grab a drink downstairs in the café and bring it up to the rooftop. Major bonus points! If sitting up on the rooftop during the colder months isn’t your jam (I don’t really mind), then The Society’s café has got you covered! These days it’s all about finding great café beverages in the most Instagrammable places and The Society Café checks all of these boxes. Plus, they have a working fireplace! It’s a café, it’s a lounge, it’s the perfect place to just chill. You’ll probably end up either losing track of time or being fully aware of it but just not wanting to leave. The café offers fresh pastries, coffee and even beer and wine on tap. In addition to these quick eats and drinks they also offer a menu of sandwiches, breakfast, salads and snacks (the breakfast items looked delish) all made by hand on site. Conveniently the café is open from 7am to 11pm every day so it’s the perfect place to either start your morning or end your day – or do what I did and do both. I love fireplaces almost as much as I love rooftops so I was on cloud nine. Due to the fact it was sprinkling (or raining) during most of my stay sitting in front of the fireplace was the main place I wanted to be while at the hotel. But really, who could blame me? Portland is one of those cities that people talk about but for some reason it's hard to make it out to the Pacific Northwest - and for some reason its twin on the East Coast, Portland, Maine (by name only), floats higher to the top of people's minds. The thing about Portland, Oregon is there is an underlying charm that no other city has. You may get a little taste of it when in Brooklyn, New York but is there a TV show called Brooklandia? I think not. The Society is able to embrace Portland's weirdness and charm and package it up as no other accommodation option in the city has. You don't go to The Society in search of butler's, room service and crystal chandeliers. You go to The Society because you want a unique experience that feels more like home. Because you want to be around likeminded people. And more importantly because you want to experience the culture of a city from the past to the present when you travel. Or at least you should try to. FUN FACT: The Society is set to open their sister location at the 80-year-old Bingen School in Bingen, Washington in the Columbia River Gorge, Summer 2019. There will be multiple buildings offering private rooms, bunkhouse accommodations, and new stand-alone cabins! I will only state this one time, but it's something you will notice upon your arrival, and therefore something you should know. The homeless situation in Downtown Portland is painfully apparent. Coming from NY where we definitely have a homeless population I was very surprised to see the amount of them throughout the city. The Society Hotel itself is awesome, the architecture, the service, the proximity to everything you want to do, but this also comes with the flip side of the fact its Old Town location has a homeless issue. There is really nothing to worry about in terms of your safety, but it's better to know into a situation fully aware of what you may encounter. Other than that you will have a great time! BIG thank you to the team at The Society Hotel for setting me up with an awesome corner room and giving me a unique hotel experience I have yet to encounter anywhere else on my travels. You better believe a trip back to Oregon is on my calendar for Summer 2019. This is one property you don't want to forget the next time you book a trip to Portland. So do yourself a favor and pin the images below for safe keeping!